For those that are interested and are ready to invest on Recyclix company kindly read this guidelines below so that you will clearly understand how it works and how you can make a lot of profit from this company. We would like to remind you that our company is engaged in plastic waste recycling and we offer you to take part in it as a recycler using revenue share model. It works really easy: you purchase waste and then receive profits. You can make a deposit via credit cards and Bitcoin as well as wire transfer. After making the deposit, you will be able to choose yourself in what way to make money work for you. Firstly, you can purchase waste for recycling. Secondly, you can buy regrind material that is produced from plastics and is used for making granules. Thirdly, you can purchase a share in our equipment in order to contribute to the factory’s growth and receive benefits. Depending on your choice and several factors like cycle duration, volume of recycled material, current climate on the recycling market, and factory growth rate, you will receive a revenue share. You can vary your earnings by buying more waste and opting for an unfinished or full recycling cycle. Recyclix is responsible for the safety of funds you spend on the raw material as well as for receipt of profits by you in the exact amount specified in your member’s area and purchase of materials recycled by you at any time. Apart from it, you can earn by attracting new partners for Recyclix and receiving 12% every time they deposit through card, bank account, or BTC. You can find more about it in your member’s area. The minimum deposit amount is 20 EUR. The maximum one-time deposit via credit cards is capped at 500 EUR, Bitcoins and wire transfer deposits are not limited. The minimum payout amount is 20 EUR. The maximum payout amount via Paypal is capped at 500 EUR, Bitcoins at 5,000 EUR and wire transfer at 10,000 EUR. You receive 6% from the amount of recycled material after the 1st recycling cycle that takes 3 weeks. Then you receive 8% more from the difference in price of the material after the 2nd recycling cycle that takes 2 weeks. Totally, you receive 14% from the amount of recycled material after the full recycling cycle that takes 5 weeks. The number of full recycling cycles is not limited. In order to transfer your accumulated profit to your account balance, please click on RECYCLE button after the completion of the cycle. 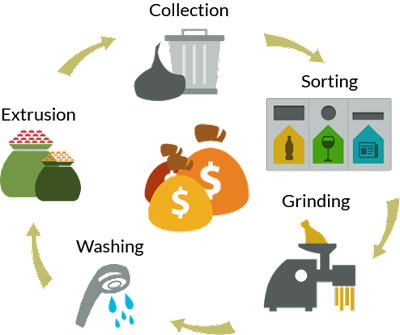 If you want to recycle large amounts of waste with the value from 1000 to 27,000 EUR, or 5000 to 135,000 kilos of waste, you will be provided new opportunities to generate even more profits by purchasing shares in recycling equipment. By purchasing available shares in the recycling equipment, you will be able to boost your profit from 14% for the entire recycling cycle to 50% upon sale of the granules. Funds spent on purchase of the production facilities are non-refundable since they give you unlimited benefits for receiving higher profits. You can purchase 5 different equipment units at our factory. Used for transporting waste within the factory premises. Increases the amount of waste you can purchase but doesn’t influence the revenue share. The maximum purchase amount of forklift shares is а 20,000 EUR. Used for sorting out the waste for its further recycling. Increases the amount of waste you can purchase and your revenue share from by 4% to 8% to 32%. The maximum purchase amount of sorting line shares is 20,000 EUR. Used for speeding up the grinding process of waste for its further recycling. Increases the amount of waste you can purchase and your revenue share from by 5% to 9% to 33%. The maximum purchase amount of shredder shares is 30,000 EUR. Used for speeding up the washing process of the material. Increases the amount of waste you can purchase and your revenue share from by 7% to 10% to 35%. The maximum purchase amount of washing line shares is 40,000 EUR. Used for melting and molding the final product, granules. Increases the amount of waste you can purchase and your revenue share from by 8% to 13% to 50%. The maximum purchase amount of granulator shares is 50,000 EUR. If you would like to receive the entire amount of funds you have spent for the purchase of material, you will need to click on Sale button after the completion of any cycle. We will sell your material and send you the money. In case if you want to sell the material after the first or the second cycle, you will have a negative account balance since the revenue share won’t be sufficient for creating a positive difference in price. For example, you buy waste for 100 EUR and then sell granules after the completion of the full cycle for 300 EUR. Your profits for the first cycle will be 6 EUR. Your profits will depend on your revenue share and amount to at least 25% according to the rules. This way, you will receive 25% from 300 EUR or 75 EUR. Overall, you will earn 6 EUR and 75 EUR or 81 EUR after the full recycling cycle. We recommend you to take the production process information displayed on our website seriously and purchase shares of the necessary equipment sensibly so that you can achieve the ideal ratio of raw material and equipment costs. However, we believe that you will use your common sense and understand that you will not be able to maximize your profit rate if you only buy a lot of waste without any equipment. We remind you that in order to transfer your earnings to your account balance after the completion of the full cycle, you must click on RECYCLE button and not on SELL button. The profit amount upon selling of regrind material or granules is calculated this way through multiplying the material quantity by the revenue share. The revenue share depends on the amount of funds you have spent on equipment and varies from 25% to 50%. The material is sold at the market price on the selling day. And remember that our company will be glad to offer you unique partnership conditions for orders from 100,000 EUR. In cases like this the negotiations will be held in our offices in Warsaw, Riga, or Lomza. You will be able to visit our factory and we will explain you the recycling process in detail. Our 20 EUR promotional campaign is about to be over and we hope that you will have enough time to get familiar with how our system works and use this offer. If you have any questions about the system or recycling process, we will be glad to give you detailed answers during business hours at info@recyclix.com or by phone +48 662-862-010. Click HERE now to register on Recyclix company. Note: Use 839F-2E64-A163 as your Master Account ID to join my team and receive your free €20 after successful registration.